Thank you to the 120-plus people who provided input on our structure and suggestions regarding how we may connect. The seeming fuzziness of the roles and goals of our Workgroups (WGs), Program Teams (PTs) and Strategic Initiatives (SIs) is not as great as people may think. Many consistent findings arose across the different structural groups. A summary of our findings follows. Workgroups (our oldest unit of structure) are the most readily understood. They represent active “communities of practice” (that can come and go) and are the primary place where people plan and implement (noting that such groups are both formal and informal). One point of interest is that people didn't realize they could close or start workgroups as needed. Program Teams bring together people (typically from different workgroups) who are working on related but distinctly different topics to network, share and learn. One clear observation is that PTs vary considerably in terms of the diversity of WG representation (e.g., 1 PT has 12 WGs and a few PTs have just 1 WG). SIs are our highest form of aggregation (and currently the one that enjoys the least clarity). They function to unify, communicate and advocate as the umbrellas for the work we do. The recent addition for the SIs is the development of the Focal Areas and Grand Challenges, providing the opportunity to see the unifying focus in our efforts. For more information about how workgroups, program teams and strategic initiatives fit together, see https://ucanr.edu/sites/StrategicInitiatives/files/295191.pdf. Of the 81 workgroups, quite a number are considered very active and effective (21) - while another 29 are somewhat active and 3 are new in 2019. The remaining 28 WGs have been inactive as reflected by personnel or goal changes. The inactive WGs will be officially closed (see list at end). These can be easily reopened if demand arises. The goal is for WGs to align with a single PT which likely means realigning the PTs - see point #3 below. Currently some workgroups have no PT, whereas other WGs have aligned with many PTs. The next step is to collect input and look at reformulating/reaffirming the PT themes. Currently, we have 21 PT themes. Some have no WGs under them. Others have many WGs under them. As indicated above, some workgroups have aligned under many PT. This creates uneven structure and at times uneven activity. 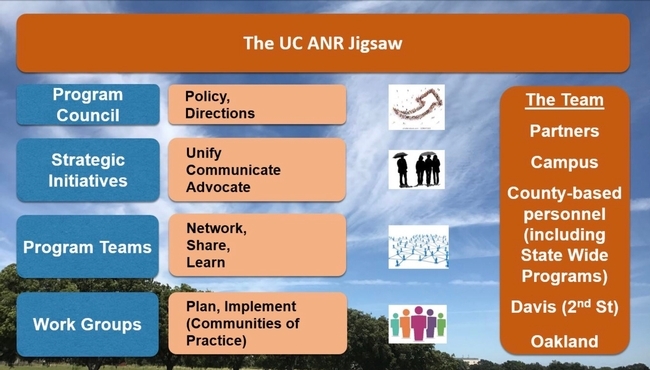 As we go forward, we encourage people to help identify needed PT themes to 1) better represent the collective work of UC ANR, 2) create or show clearer paths for people to connect at the WG, PT and SI levels, and 3) help us refine the SI Focal Areas and Grand Challenges – providing greater clarity of our efforts and clearer SI alignment with the reformulated PT themes and WG efforts. The PT discussions will include a webinar and county visits over summer. Thank you all for your efforts and we welcome input. Note: If there is interest and leadership, workgroups can be readily opened by this simple new workgroup request.